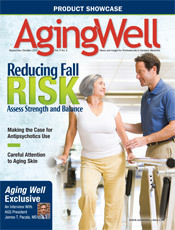 Recent data suggest that fall accidents are on the rise among the older adult population. In fact, according to the Centers for Disease Control and Prevention (CDC), each year one in three adults aged 65 and older experiences a fall. Falls are now the leading cause of injury-related deaths among this population and the most common cause of nonfatal injuries and hospital admissions for trauma. However, researchers at Virginia Tech and the University of Virginia are looking to change these disturbing fall statistics. With a $1.2 million grant from the National Science Foundation’s Smart Health and Wellbeing program, they are creating a portable fall prediction monitoring system for the early detection of fall risk that can provide diagnosis and treatment before a fall occurs. With the aid of the grant, a device is in the development stages that could be worn by older adults to measure potentially small declining changes in gait, posture, and mobility—all major indicators that can help point to a future fall. The sensor will function for several days between battery recharging, collecting long-term data during everyday wear, explains Thurmon Lockhart, PhD, an associate professor in the Virginia Tech Grado department of industrial and systems engineering and a researcher involved with the grant. An early prototype of the sensor has already been built and tested under a previous National Science Foundation-funded project. In-clinic studies have used a wristwatch-sized node worn on both the wrists and the ankles as well as the sacrum to collect data. The product’s wearability is important, and researchers are contemplating incorporating these sensors into a faux piece of jewelry. The final product will also develop a monitoring system called ROOP-Alert (for Remote Observation Operating Platform). Lockhart says it will bridge gait and posture analysis, body sensor networks, low-power radio-frequency wireless communication, and gerontology. Once the device has collected the necessary information, data-processing algorithms will provide a mobility analysis and fall risk assessment for each patient. Physicians will be able to determine which of their patients are at the greatest risk of falling and then implement fall prevention measures.